When two petty car thieves find audio recordings of a dying man, tensions rise as one is determined to return the car and the other is desperate for the cash. 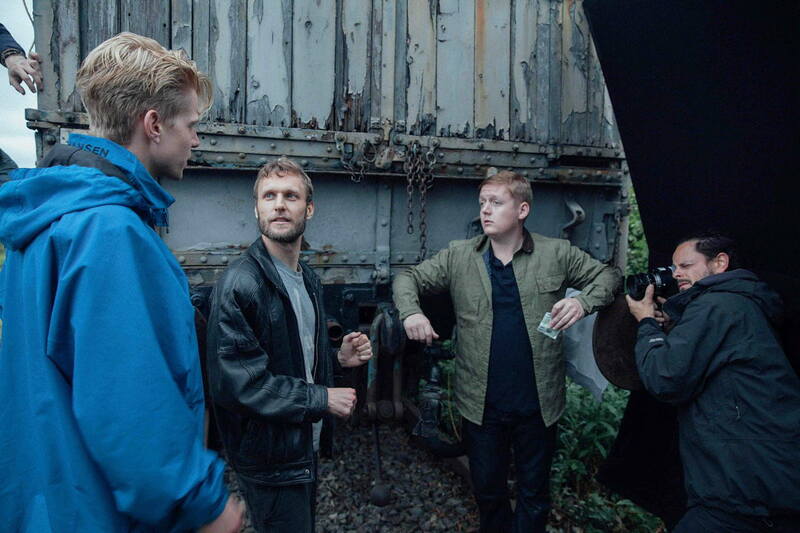 Director Rene Pannevis sat down with Directors Notes to discuss the production of his squabbling car thief short Jacked and explain why he had to sacrifice shot beauty in favour of world building storytelling and how small details and backstory enrich the wider narrative. You grew up in The Netherlands in a hippie neighbourhood. Do you think that free upbringing has coloured your approach to filmmaking and storytelling? Yeah it was very free. I grew up in a neighbourhood where all the gardens were connected to each other, facing each other and they gave the people living there – it was all young families with young children – a bit of money to do whatever they wanted to with the neighbourhood, build a playground or whatever. As well was that, all these young families were doing little theatre shows on Friday afternoons and the children would be running naked on the grass. So it was already a community a little bit involved in theatre and a little bit involved in that kind of hippie spirit thing. So for sure, that theatre part stuck with me. I actually took theatre studies for a year, which comes back a little bit in filmmaking. Your artistic notes always comes from where you grew up and your background. How did you end up travelling from The Netherlands to study at NYC Tisch? I did film studies first because I was too young for the film academy in The Netherlands (you have to be 18, I was 16), so I thought I would do film studies and get hands on experience and then I could probably make it as a director. That was the wrong choice because when I turned 18/19, I realised that with my film studies I could never really gain entry into the film world in Holland. It’s a very small circuit that’s very closed and they definitely don’t allow film studies students in there. So I needed to actually do an academy or a film school. I wanted to go to the best film school and NYU Tisch is one of the best film schools in the world. I applied, did the whole thing: the creative portfolio and shot a film on a Super 8 for my application. What was that application film about? It’s never been released, it was made purely for the entry. It was a very personal story which was totally connected to my father. I’ve always really liked that story because it’s based on events in my own life. The title back then when I sent it off was Not Since Crude. It’s shot beautifully on Super 8 but not that well edited because in those days I was not a really good editor. I think if I went back into the material I could probably edit a nice film out of it. 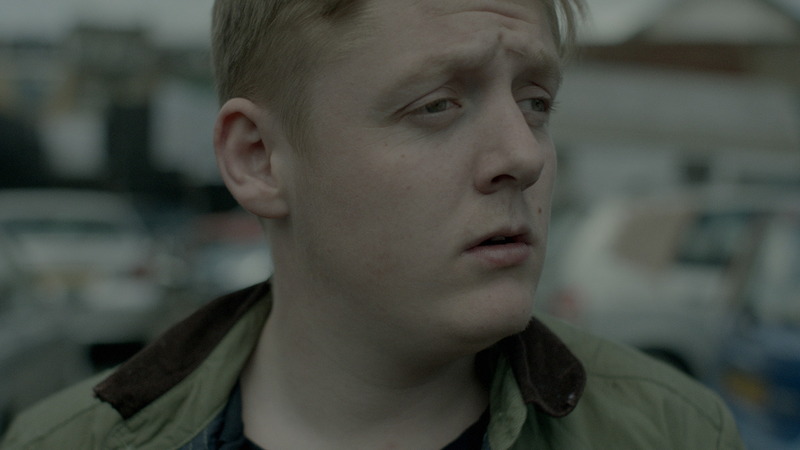 Jacked was supported by the London Calling programme. What was that process like? You also reached out to the Indiegogo community, how did you find that experience? We’ve spoken to quite a few filmmakers who talk about crowdfunding being almost as much work as making the film itself. It’s a lot of work! I found another project that I really liked the aesthetics of and I kind of copy that a little bit for my main layout. For me it’s important that the layout of your Indiegogo or Kickstarter page looks good. Also your video has to be engaging, as do the storyboards, they can’t look too student-like, so there’s a lot of stuff to think about. Luckily, I have a friend who is a good director and he was willing to use his camera kit and his nice lenses so we could actually shoot a nice video. Again, it’s a lot of work but that’s the case with everything; a short film or a feature or whatever, you have to put a lot of work in if you want to be successful, if you want to make it work. How much backstory did you provide to your actors to fuel their motivations in the film? There was a lot of backstory and it actually goes quite far, stuff that’s not even in the film. There is a moment in the second car that they try to steal where Charlie Palmer Rothwell’s character knows how to steal the car because his father has that car and there’s a line about his father. So for me, the backstory for Charlie was about his family, his relationship with his mum and his father, why he’s stealing cars. All that stuff you don’t really see in the film but it shapes his character. He’s a fighter as well so when we see his hands they have rough spots. Or the really bad tatoo on his neck. It’s obviously not a tribal or a cool thing. It sets up his character. He’s this crazy kid that could have done that tattoo by himself when he was like 13 years old. That was all related to the story because if you know his personal background it fits the content of the film. Clearly, a major component of the film was going to be the recordings delivered by Nicholas Ashbury as that’s what connects with Waylen and drives a wedge between the friends. How did you approach casting and directing those? My most important casting point was finding a voice that fit with Thomas Turgoose. He’s from Grimsby in the North of England so I wanted to have a Northern English voice, that was key. I really wanted to have a voice that he would connect to, that almost talked the same. That was quite difficult. We found some people from Grimsby but the voices weren’t right. It had to be a voice that feels honest, that wasn’t too commercial either. It had to feel realistic and truthful, like it could be somebody from the street. Details are important because it’s the truth, it’s the truth of the story. Nick had that kind of voice. He had a very warm voice but you could also hear that he smoked a lot of cigarettes, you could hear something unhealthy in his voice that I really liked. He did a couple of takes and hit the right note immediately. I didn’t have to direct him much. He got it. He got the script. He just changed a couple of words here and there into his own. It was actually a very easy working relationship with him. And so how much of that did you play to the actors on set? Funnily enough, in the car I was the voice. I was sitting in the back of the car. We were shooting in a Jeep, they were obviously in the front and we had the cameraman on the back seat and I was lucky because it was a Jeep there’s a trunk where I could sit with the video assist. I was giving them voice over lines because we actually had to time it really well because the voice comes in in the Rotherhithe Tunnel, this beautiful tunnel in London. We had to time it well because I wanted them to have a couple of lines and then immediately get into a fight when they got out of the tunnel. We had to time that a couple of times – going into the tunnel, turn around, travel back and then going back into the tunnel. The timing was quite important for that. We changed a couple of things here and there for the tape dialogue but it was kind of set. However, Thomas and Charlie’s dialogue changed a lot on the shoot day because Thomas doesn’t like remembering and saying lines. I loved working like that because I could say to him, “Please give me a joke, please give me another joke”, and it keeps him on his toes and he will give me another joke that was actually better than what he just did. If you give Thomas freedom to do the action that you have in your head, then be a bit free with the words, his performance improves a lot. That said, they actually stick to a lot of lines in the script as well so it looks all improvised but it’s not, so there’s a funny balance. What were your equipment choices for the three day shoot, given the consideration that much of it would unfold within the confines of a car? Well, because I worked for Archer’s Mark, which is a production company, they were willing to give me a Red Dragon for free which I thought was great. But then I met Tim Sidell, who’s a great DoP, and he didn’t like that choice at all. He wanted to shoot with the Alexa as post-wise it’s already a much better choice. The look of it is much softer, it’s much more cinematic than the Red Dragon. I’m actually quite happy that he fought for that decision because in my opinion it looked better than the Red Dragon. The thing with the car was lucky because we shooting in a Jeep so we had enough distance to the characters to actually shoot with a 2.8 and long lenses. If we’d shot in a really tiny car that would have been really difficult because we’d have had to shoot everything with wide angle lenses. Because you’re so close on your character you wouldn’t have the soft background or the detail on the face. 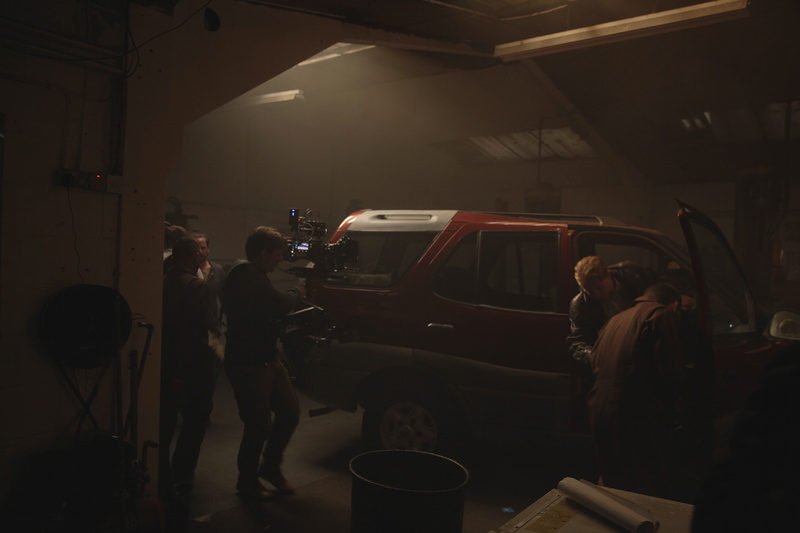 The shot that particularly stood out for me was that sweeping move around the car as it’s stripped. It feels like it could be a set piece shot but you treat it so matter-of-factly. That location was really beautiful and we had to compromise for that shot. If you would have seen the wide shot from behind with the light, because the roof was broken, it was a beautiful. We shot it at the time of day that the light perfectly came in, around three o’clock. We had to choose between either going for this amazing location or doing this dance around the car where you see details of it but we’re not lingering too long on any one thing. We’re not really seeing the licence plate being changed or the guy putting in the new window. We do see him putting it in there but not too obviously. The dance around the car was purely for showing a couple of frames of detail and then moving on. So we made a decision to kill the beauty of the location and just keep to one shot around the car. In the end, it was the DoP’s choice and I think he made the right decision. I liked it because it quickly reveals the well-oiled machine of this car jacking ring. That’s nice that you noticed that! That’s a very important point because when they drive the car into the garage the car gets stripped really quickly. That’s because this car has another purpose and you have these two little car thieves that are just low petty criminals or whatever. But when they come into the garage there’s a proper criminal organisation going on there and they know what they’re doing. They’re very very professional. I wanted to show how quickly they can strip a car because when the main character goes into the office to talk with the boss, you’ll see in the background that the car is driving off and it all happens in like in a minute and a half. They strip the car in a minute and a half and the car can go on to do a bigger job. It could be robbing a bank or whatever it is, that’s another story. But that’s the purpose of the car. It’s not just a car for cash money, it’s a car that has a purpose in a bigger crime organisation. Therefore for me, it was a very important detail that all the cars they tried to steal are big SUVs. They have to be big cars because big guys will be in that car and the car probably has a bigger purpose. So when they walk into the Oval in Hackney, the place where a lot of cars are parked, they skip all the Mercedes and BMWs and all the small cars because they’re aiming only for a huge car. It’s a minor detail nobody would notice which cars they pick and choose when they’re watching the film, but it’s a very important detail for me – partly because where I come from I know a lot about the car scene and those details are important because it’s the truth, it’s the truth of the story. It’s not a fairy tale that I’m trying to tell. I know this world. This interview was taken from a longer podcast DN recorded with Rene Pannevis at the London Film Festival.